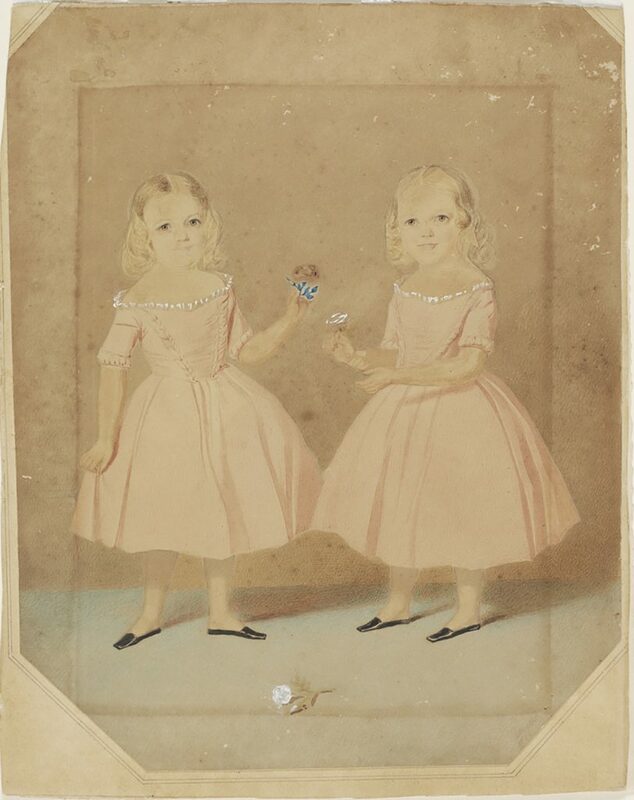 This rare full-length double portrait records the Stephen twins at about four years of age. The girls are shown standing side by side, their bodies turned toward each other in a front facing pose, each holding a flower in one hand [perhaps a red and a white rose] with another bloom lying on the floor between them. The girls wear identical outfits comprising knee-length pale pink dresses, the ruffled edges of their white chemises visible around low necklines set wide on the shoulders above tight-fitting elbow length sleeves, with bands of ruched trim at the edge, and form-fitting bodices with v-shaped, ruched centre front panels, and round waistlines above wide, pleated full skirts worn with black low cut, square-toed, flat slippers without stockings – perhaps as a concession to the heat of an Australian summer. They wear their shoulder length blonde hair centre parted and gently curled over their ears. Throughout the Victorian era, girls’ clothing closely followed that of their mothers. From early childhood this meant dressing in form-fitting garments, often worn over tightly-laced underbodices cinching the torso and waist, in training for adulthood. In the 1840s, small boys and girls of all ages wore dresses with elaborately shaped low cut bodices, revealing bare necks, shoulders and arms, tight-fitting sleeves and full skirts held out by four or five petticoats. Pantaloons were often visible below mid-calf length skirts, usually worn with stocking or socks and flat slippers or boots. Born on 18 Feb 1844, Alice Mary Stephen (1844-1902) and Sarah (aka Saidee) Consett Stephen (1844-1932) were the twin daughters of Sir Alfred Stephen (1802-1894) and his second wife, Lady Eleanor, nee Bedford (1810–1886); the eleventh and twelfth of Sir Alfred’s eighteen children, and the fourth and fifth of nine children born to Eleanor, his second wife. The arrival of Alice and Saidee was followed by the birth of twin boys in 1847, one of whom did not survive. Although the girls are not dressed for mourning, it is possible that commissioning of this unusual portrait was occasioned by this recent bereavement, with the single fallen flower between them indicative of an innocent life lost. NB: The female fertility rate at the middle of the nineteenth century was equivalent to six babies for every woman, with the infant mortality rate at 125 deaths/1000 births – 27 times higher than the rate of 4.63 deaths/1000 births today. In 1842 the Stephen family moved to Lyon Terrace (demolished in 1900) in Liverpool St, near Hyde Park and close to St James Church. The twins were born the same year their father became the colony’s third Chief Justice; he was knighted in 1846. While the Stephen boys were sent to boarding school, their mother oversaw the girls’ education at home, employing the services of a superior governess and following a strict curriculum. In this busy and crowded household, Lady Stephen supervised the girls music practice before breakfast, and escorted them to dancing lessons and extra language lessons several mornings a week. In 1866, the Stephens moved to ‘Orielton’, a large, elegant and comfortable house in Ocean St, Woollahra, with harbour views. As the ‘home daughters’ of their father, Sir Alfred Stephen, the twin sisters, who were almost indistinguishable, were inseparable companions doing most things in common, especially following the death of their mother in 1866. Both were enthusiastic musicians. Saidee was also a gifted linguist, able to speak five languages fluently. For many years in the earlier part of her life, she had acted as confidential secretary to her father, handling all his correspondence and assisting him in his legal work. She died at the age of 90 years at her home in Woollahra. Alice had died 30 years previously. MIN 200; MIN 201: 1/6th plate ambrotypes: The sisters are similarly attired in off-the-shoulder dinner dresses with pointed waists, pleated skirts, and white chemises visible at the edges of their short sleeves and neckline. Their hair is tied back and both girls wear identical cross pendants, and jet brooches pinned to the centre front of their corsages.